Bloxygen blocks oxygen. In certain circumstances, that could be devastating; but in the case of expensive varnishes, it’s devastating if you don’t block the oxygen. 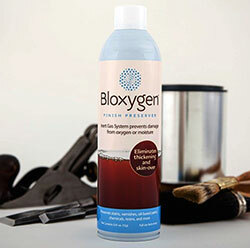 Using powerful and natural Argon (part of the air we breathe), Bloxygen forms a heavy (relatively speaking) blanket on the surface of your finish that protects the finish from oxidizing. Unlike oxygen, Argon does not react with your finishing liquids. A short spray of this heavy, inert gas into your storage container will protect your liquid finish from reacting with the oxygen or moisture present in our normal atmosphere. Once you have sealed the container, the gas inside will remain. The heavier Argon gas will provide a layered blanket of protection and help prevent a cured skin from forming over the liquid. No more congealed surprises when you open a can of spar or tung in a jar. By using all your finish, you cut down on hazardous waste – a significant environmental concern, especially for anglers. Each can, which feels empty upon arrival, contains enough gas for about 75 two-second squirts. Each squirt will save up to a quart of finish in a can, or far more finish in a narrow dip tank with relatively little surface area compared to the volume. Nothing works better to help ensure the preservation of the varnish in your dip tank. The thought of not having to clean out a dip tank clotted with finish that went south is worth the price! NOTE: Bloxygen Ships Strictly By Ground UPS, Only Within The Continental U.S.